A very versatile tone resource. Excellent range of sound blends. The dollar/pound exchange rate makes it more expensive than we’d have liked. Beetronics is a California-based boutique pedal maker with a bit of a fixation on our tiny, striped, honey-producing friends. Its small range of handmade pedals have names closely related to bee culture, while the internal circuit boards are artistically designed to reflect apian themes: open up a pedal and you may see a PCB that looks like a honeycomb. While the company undertakes custom orders, it also has a Standard Series of three pedals with a distressed finish (Octahive, Overhive and Whoctahell), and the more pristine Royal Series comprising the Buzzter and the Royal Jelly. The latter is a collaboration with Howard Davis, a circuit designer known for his work with Electro-Harmonix in its hugely creative 1976 to ’81 period, and also with Pigtronix. The Royal Jelly is a pedal that offers overdrive and fuzz in parallel, but rather than delivering that by having separately footswitchable fuzz and overdrives side by side, it presents them as two adjustable preset blends that you can switch between. This means you not only have a massive range of hybrid overdrive/fuzz sounds on offer, but you can also have separate overdrive and fuzz by setting each blend to be totally overdrive or totally fuzz. Add in Low and High EQ and a knob to blend in your dry guitar sound, and there’s a quite a sonic landscape to explore. 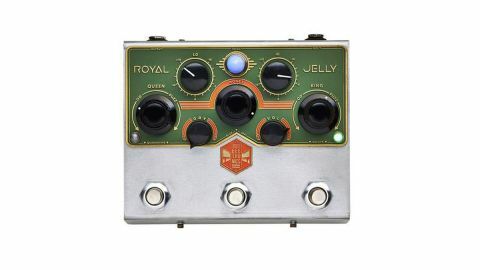 The Royal Jelly is a reassuringly solid and weighty pedal. Its two overdrive/ fuzz blends are known as Queen and King, and are switched between with the left footswitch in the row of three. The right footswitch is the pedal bypass switch, and the middle footswitch engages a high-end EQ boost that is an add-on to the fuzz circuit. The gain for the overdrive circuit is set by the Honey knob that’s placed centrally in the pedal, while overall EQ is provided by the Lo and Hi knobs that each provide up to 10dB of cut or boost. The remaining two knobs set the output volume and the dry blend, from completely dry to completely dirty. The overdrive here is driven, amp-like on full gain, and excellent for some just- breaking-up tones at the other end, with plenty of nuance available by blending it with some dry sound. In fact, the dry mix allows plenty of variation whether you’re using it with purely fuzz, overdrive or a combination: you can dial in a frisson of dirt sitting behind your clean sound for interest, body and maybe a little extra sustain; create a layered sound and perhaps the sense of two instruments in unison; or you can simply use a smidgeon of dry to add extra clarity and string definition to your dirt. The fuzz circuit yields classic fuzz - fat and sustain-y with an edge, but nothing outrageous. Hit the middle footswitch to bring in the Buzz, though, and any perceived politeness is dispelled as you get a taste of 60s fuzzbox gnarliness with edgier top-end, richer with more harmonics, especially if you have a high EQ boost dialled in. That EQ is well thought out with nothing too drastic, but enhancement in the areas that most benefit. For example, adding more body in the bottom-end, delivering a top-end lift for added stridency, or mellowing it out. the fuzz. You can’t use this pedal purely as a dual-channel overdrive (or as a dual fuzz), with one side gainier than the other. However, you can do a similar job with slightly differing blends to give you two related but different sounds for onstage use, and the way that the overdrive and fuzz sounds meld together seamlessly will give you a range of tones that you just wouldn’t get from stacking individual overdrive and fuzz pedals. This pedal takes an individual, perhaps unusual, approach to the double-dirt pedal genre, but it can work really well, offering the ability to instantly switch between two hugely or subtly different sounds. With three combinable elements (overdrive, fuzz, dry) to sculpt those sounds, it’s a very versatile tone resource.